The Google Playground event may have been cancelled but that didn’t stop the internet juggernaut from unveiling its Google Nexus line and Android OS refresh, albeit in a less glamorous manner. Earlier today, we covered the official announcement of the LG Nexus 4 and the Samsung Nexus 10. Now, we have a summary of those reports as well as additional information about other announcements that Google made today. In a surprise move, Google went ahead and revealed their upcoming devices via the web, a place where Frankenstorm Sandy has no domain. As expected, the Google Nexus line now includes the new LG Nexus 4 smartphone, the Samsung Nexus 10 tablet, an update to the Asus Google Nexus 7 and Android 4.2, which bucks the trend and is still going by the “Jelly Bean” name. Rumors about the latest flagship Google Nexus smartphone have been floating around the internet for weeks. The tech press has been accurately reporting on how the Nexus was going to look and what features it was going to have long before the Google Playground event but that didn’t make the big reveal any less exciting for the many Google Nexus fans out there. Now that the phone is official, they have more reason to rejoice. The LG Nexus 4 will be available starting November 13 and will come in two flavors — $299 for 8 GB and $349 for 16 GB. Currently, there are no LTE versions of the device but the Nexus is heading to T-Mobile in the US and will be available with a new or upgraded contract. Samsung’s just created another 10-inch tablet, but this time it carries the Google Nexus branding. Like the LG Nexus 4, the Samsung Nexus 10 will also be available starting November 13 in the US and Canada. 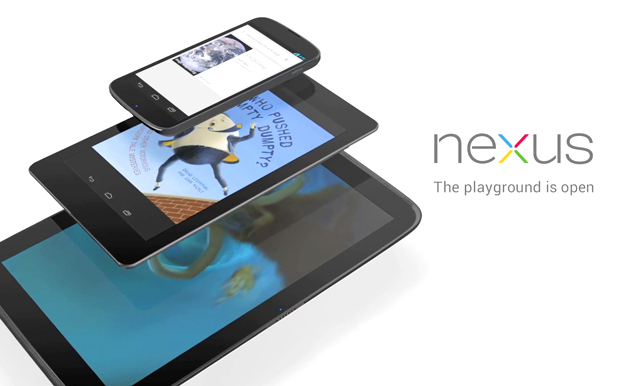 The new Nexus is also heading to Europe (via UK, France, Germany, Spain) Australia and Japan. The Samsung Nexus 10 prices start at $399 for a 16 GB version and $499 for the larger 32 GB model. We’ve been hearing rumors about this for months now but today, it became official as well – the Asus Google Nexus 7 is getting a 32 GB variant, an answer to all the fans out there clamoring for more memory on their favorite 7-inch tablet. This one will set you back by just $249. Fans of the device should also be happy that this announcement has lead to a price drop in the 16 GB model which now costs just $199. A new version of Android is heading our way but it won’t be the long-rumored Key Lime. Instead, as mentioned previously, Android 4.2 will still be called Jelly Bean. While the name hasn’t changed, it does bring with it a suite of new features that should delight Google Nexus and Android fans: Photo Sphere, which allows you to take 360-degree panoramic shots, improved keyboard gesture typing and prediction and a “Daydream” feature for when your device is docked. We’re keeping an eye for more features and we’ll be sure to share them with you as soon as they’re unveiled. Which new Google Nexus device are you most excited about – the LG Nexus 4, the Samsung Nexus 10 or the 32 GB Google Nexus 7? What do you think of the Android 4.2 updates? Discuss in the comments below!